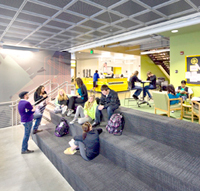 "It’s time for Americans to rethink the classroom"
"Designing schools for tomorrow’s scientists and engineers"
"New schools are shelving the old library"
"Historic schools: Restore or replace?" "Boom times at Boise State"
"Induction systems can cut school HVAC costs"
"How technology is reshaping the way students learn"
"What I’ve learned after 15 years of designing schools"
"Tacoma elementary turns to Montessori to attract students"
Active learning centers and dispersed resource programs are replacing the dusty stacks of yore. Historic schools: Restore or replace? Nowhere perhaps, is this timeworn adage more appropriate than on the subject of historic schools. Gone is the illusion of uniformly well-groomed children sitting in neat rows of desks, in rapt attention, the teacher carefully lettering the day’s assignment on a blackboard. Today, a successful classroom provides a platform for the teacher to find various ways of conveying information and engaging the student. 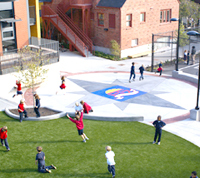 Valhalla Elementary in Auburn opened in 2009. 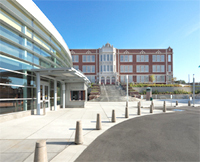 DLR Group designed the building for Federal Way Public Schools. 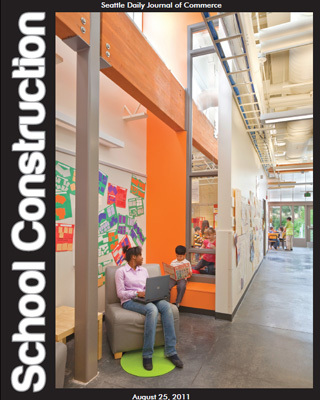 The general contractor, Babbitt Neuman Construction Co., built the project for $11.2 million.